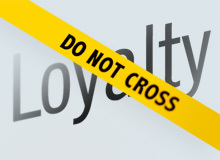 If loyalty is defined as being faithful to a cause, ideal, custom, institution or product, then there seems to be a certain amount of infidelity in the workplace these days. Consider some recent studies: MetLife’s 10th annual survey of employee benefits, trends and attitudes released in March puts employee loyalty at a seven-year low. One in three employees, the survey says, plans to leave his or her job by the end of the year. According to a 2011 Careerbuilder.com report, 76% of full-time workers, while not actively looking for a new job, would leave their current workplace if the right opportunity came along. Other studies show that each year, the average company loses anywhere from 20% to 50% of its employee base. Whatever the actual figures, some employees are clearly feeling disconnected from their work. Among the reasons cited for this: the recession, during which companies laid off huge swaths of their employees with little regard for loyalty or length of service; a whittling away of benefits, training and promotions for those who remain; and a generation of young millennials (ages 15 to 30) who have a different set of expectations about their careers, including the need to “be their own brand,” wherever it takes them. In a nomadic world, one of the casualties is a decreasing sense of commitment to the organization. Peter Cappelli, director of Wharton’s Center for Human Resources, agrees that these days, employers’ attitude toward their employees has changed. “They see them as short-term resources,” he says. And because employers have ended lifetime employment, adds Cappelli, author of the forthcoming book, Why Good People Can’t Get Jobs: The Skills Gap and What Companies Can Do About It, “job security depends now on continuing usefulness to the employer. Cuts in pay and increasing workloads happen when it is useful to the organization. As employees see their careers operating across many employers, they no longer focus their attention solely on the ones” they work for now. Loyalty, which can be considered a component of employee engagement, is based on a number of factors, says Harter, including whether the employer “looks out for employees’ best interests, pays attention to their career path, gives them opportunities to improve their well-being and so forth.” In this equation, managers play a crucial role, he adds, referring to a survey done several years ago that analyzed all the reasons people stay with or leave an organization. “If you’re looking for a silver bullet, it is the quality of the relationship between an employee and his or her manager that determines the overall level of employee engagement. Good companies develop a growing list of great managers over time…. It’s local level teams and how they are connected together by leaders and managers” that have the most impact. Wharton marketing professor Deborah Small cites a body of research on what is called “procedural fairness,” indicating that much of what employees feel about an organization “is not the outcomes they get, but the processes. If people feel like processes are handled fairly in the organization, even if they don’t get the best for themselves,” that would tend to encourage loyalty. Research also shows that not all behavior is self-interested, Small adds. “Sometimes people do things at considerable cost to themselves, like sticking to a job with lower pay when they could move on and potentially earn more money. It’s because we care a lot about relationships and the welfare of others. When we have a relationship with our firm or colleagues, there is a social cost to leaving.” To the extent that an employee is well treated by a firm or a boss, “that might, on the margin, make a difference” in his or her decision to stay or leave. Defined benefit pension plans have historically been a strong retention device used by companies to lock employees in, Guay adds, but very few firms these days offer them. More common are 401(k)s, which require employees to bear the investment risk, and which are portable — employees can take these vehicles with them when they leave the company. At the same time, stock and stock options can, in some cases, be more than a retention device. They can motivate employees to not just stay at the company, but to work hard and go beyond the minimum requirements, says Guay, adding, however, that they are most effective with high-level executives “who can actually see how their own actions affect the firms’ stock price and overall performance. Once you get too far down in the organization, there is usually less of a direct link between your actions as an individual employee and overall performance.” Some firms, he notes, have division level or plant level versions of incentive plans that can drive better performance. Growth of the global marketplace is another factor in workplace mobility. “There is a tremendous amount of competition, both domestically and internationally, which has forced firms to be more nimble with respect to hiring and firing,” says Guay. “It is now a two-way street: Employees recognize that firms are not going to be able to offer lifetime employment, and companies recognize that employees will feel free to move around.” Social and business networking plus the explosion of available information on companies and career paths have helped that process along. “In the last 10 or 20 years, it has become so much easier to find jobs in other industries or regions than it was 10 or 20 years ago when we didn’t have the Internet,” he notes. In addition, notes Cobb, some workers have brought with them, or acquired, skills that are very difficult to replace. “You don’t want that knowledge and expertise to walk out the door.” Also, disloyal employees can be a risk for an employer if they spread the word that their company is an undesirable place to work. “It affects the perceptions your customers have of you,” he adds. Very informative article about the present workplace situation and employee loyalty. One of the reasons why employees some loyal to larger companies is because they invest in the future of their employees with workplace pensions etc. In Britain it has now become part of the LAW to offer a workplace pension to qualifying employees: but at great cost to small business. Why would any employee feel loyalty to any company, when at the drop of a hat said company can fire that same employee for a reason unknown to the employee, or worse, no reason. I could wear a shirt to work one day that someone takes exception to and be fired that day, and my employer doesn’t have to tell me it was a wardrobe thing thus leaving me to wonder if it’s my ability. I think it is a two way street. A little more appreciation for the employee who is a single mother who’s depending on her job to raise her kids by herself, for example. Employers don’t care about their employees, so why should the employees care about their employers?